Have you ever cursed an API which uses magic integer constants instead of the proper enumeration? What should I pass as the titleJustification parameter here? 0 or 1? Can I pass “42” for the titlePosition parameter? Even Javadoc won’t know. I call these constants “magic” because sometimes it is far from easy to figure them out. How does it know if the method expects a “magic constant” argument? Unfortunately, only a handful of the JDK methods are annotated this way. The majority of the rest method parameters are left in the dark. As you can see, you just enumerate constant names which can be used in this place. 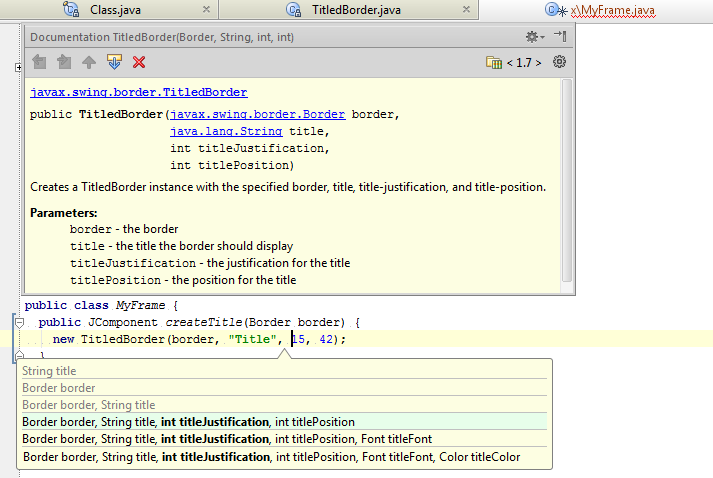 IntelliJ IDEA then checks arguments of method calls, variable assignments, etc. and warns if expressions involved are not valid, considering the data flow. 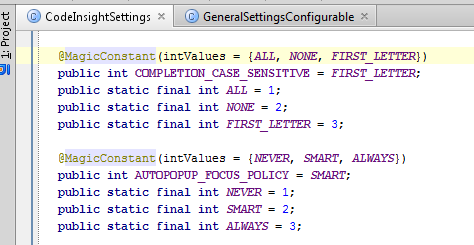 Tells IntelliJ IDEA that only one of the listed constants can be used as an argument. Tells IntelliJ IDEA that allowed value for the argument is one of the public static final fields declared in the class “ClassName”. 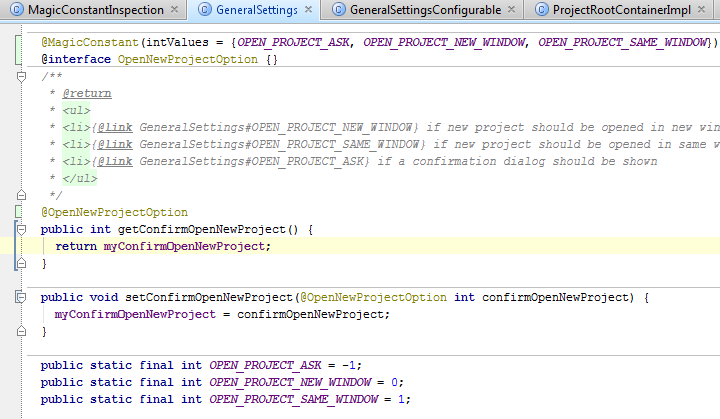 Tells IntelliJ IDEA that one or several of the listed integer constants can be combined with the bitwise OR operator. How to make it work in my setup? 1. @MagicConstant annotation sits in the IDEA_HOME/lib/annotations.jar. You have to attach it to your project in Project Structure|Global Libraries dialog. 2. External annotations for the JDK methods sit in the IDEA_HOME/lib/jdkAnnotations.jar. It is attached automatically to your JDK as soon as you enable the “Magic Constant” inspection (see the Project Structure | SDKs | Annotations tab). This entry was posted in New Features and tagged Code Analysis. Bookmark the permalink. Is it possible to annotate code that lives elsewhere? Any reason why the annotation.jar is not on Maven Central ? Can i republish it (possibly under different groupId to use existing pipelines) to Central if Jetbrains is not interested in doing so ? Might be useful for usage and clarifications of existing code libraries and APIs, but “now” that enums are available and there is no reason not to use enums instead of magic integers with an excusing annotation (except maybe in some cases for performance reasons in Android). @Tony Menzel You are welcome to do so (annotations.jar are Apache 2 licensed after all) but under the different groupid please. Could you please think of how to improve or add a way to suppress the inspection without disabling it. Wonderful enhancement! I love it. (I’ve always hated named constants. enums are so much cleaner.) Thanks.